Magnetic North is a creative space for makers, doers, thinkers, and tinkerers. We value DIY aesthetics, hard work, high fives, and unbridled creativity. We thrive on late nights, early mornings, and everything in between. Our artists are always working, always making, and always having fun. The space is built for work. We have a full screen printing and printmaking setup as well as a topcrest wood shop. We cater to young creatives pushing their artwork and their businesses. We offer 24 hour access to office spaces, workspaces, and tools. We are trying to make sure that Portland stays a bastion for artists seeking true north. The studio houses 18 of Portland's most talented creatives: Illustrators, designers, dinosaur drawers, furniture makers and skateboarders. We love collaboration, rocking a project, and wiping the sweat off our brow. We are always open for design projects and would love to help you create exactly what you need. 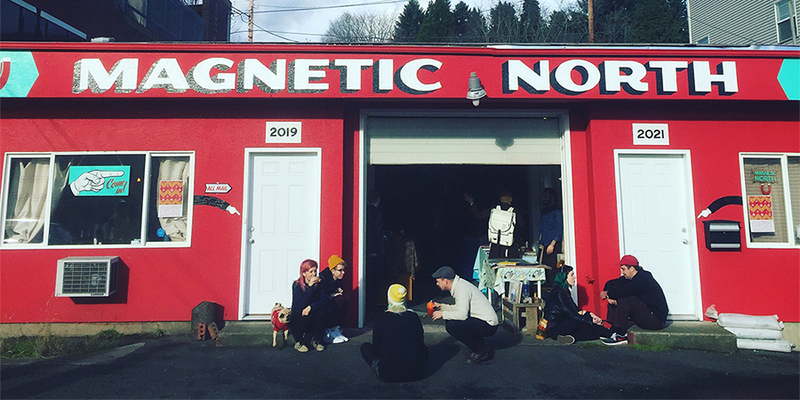 Come join us for teaching events, speakers, art shows, and craft sales and follow us @magneticnorthpdx and if the big door is open, stop on by neighbor!